If you look at the picture above, you probably think of the Mighty Morphin’ Power Rangers, costumed heroes who have been kicking their way across TV in different incarnations for nearly 20 years—but you’d be wrong. These are actually the Zyurangers, the stars of a Japanese TV series that inadvertently spawned a global sensation. Kyōryū Sentai Zyuranger is now known as the progenitor of Power Rangers in the U.S.—but that almost wasn’t the case. American audiences could’ve experienced the wave of mania that accompanied Mighty Morphin Power Rangers almost a decade earlier—and it would’ve been thanks to Marvel founder Stan Lee. In the 1970’s Marvel made a deal with Toei, the production company behind the “Sentai” tokusatsu shows—a series of live action, special-effects-laden kid’s shows about different teams of masked superpowered heroes fighting monsters. Sentai had become a smash hit in Japan in the ‘60s and ‘70s. Stan Lee saw an opportunity to bring the Sentai concept to America—and in exchange, he lent some of Marvel’s most iconic comic book characters to Toei to create shows around. Marvel and Toei’s deal created four shows: the infamous Japanese Spider-Man, plus three Sentai series called Battle Fever J, Denshi Sentai Denjiman, and Taiyo Sentai Sun Vulcan. The agreement left a permanent mark on Sentai show history: after the introduction of a giant robot for Spider-Man to use in Spider-Man, Toei adapted the concept to all Sentai series going forward: amping the scale of the action up, and turning the entire genre into “Super Sentai” shows. The deal however, went no further—the relative failure of Spider-Man made Lee hesitant to give Toei further Marvel characters, and an attempt to adapt Sun Vulcan for America failed, leaving Marvel and Toei’s deal to expire. Toei were invigorated by it however: thanks to Marvel, the Sentai genre had evolved into Super Sentai, and was reaching a new height of popularity in Japan. Although several Super Sentai series had made it out of Japan during the 80’s—most notably Goggle V—none had made it to the U.S. It would take nearly a decade for someone to attempt after Marvel, but unlike Marvel’s own plans for Taiyo Sun Vulcan, the adaptation would be far more extensive than simply dubbing one of Toei’s shows into English. Enter Saban Entertainment. Haim Saban, the head of Saban Entertainment, approached Toei offering a partnership to air the then-most recent Sentai show, 1992’s Kyōryū Sentai Zyuranger. He had become fascinated by the Super Sentai concept, after seeing the 1985 show Bioman. But unlike Marvel, Saban did not want the full show: Their request was simply to use the action sequences that had been shot for all 50 episodes of Zyuranger, so that Saban could build an entirely new action series around it (and, most importantly, own the majority of the rights to it). This allowed Saban to essentially eject the vast majority of Zyuranger’s plot, and develop a vastly different story to slot the action sequences into. Originally, Zyuranger was not about modern-day people becoming superheroes, as many Super Sentai shows were. Rather, it was about a group of Humans who came from an ancient civilization that existed during the time of the dinosaurs 170 million years ago. The 5 heroes—Boi, Mei, Dan, Goushi, and Geki—were placed in suspended animation following the sealing away of their evil rival, the witch Bandora, only to reawaken in ‘90s Japan, following Bandora’s escape. Each hero represented one of 5 prehistoric “Guardian Beasts”, and they invoked their powers to summon giant robot dinosaurs and battle Bandora’s alien forces from a planet named Nemesis. Saban thought that, while the use of the action footage (where all the actors were masked by their superhero suits, and therefore unrecognizable) would save their show a considerable amount of money, the story itself wouldn’t resonate with American audiences—and adapting the Super Sentai concept was already a risky enough venture for Saban, following a costly legal dispute the company endured with Children’s TV company DIC Entertainment the year before. 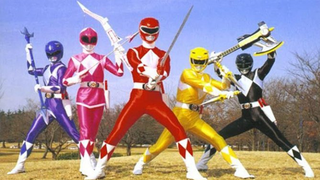 So Saban chose to completely cut the non-action scenes and film its own story, transplanting the action to a fictional California town and changing the main cast to be a group of diverse American “teenagers with attitude”: Jason, Kimberly, Zack, Billy, and in a major change from Zyurangers, a second female star, Trini. Trini would replace the male yellow TigerRanger Boi—hence why in all the costumed sequences, the yellow ranger’s suit doesn’t have the same “skirt” attachment as the already-female Pink Ranger’s. Certain other elements of Zyuranger remained—Bandora the witch became Rita Repulsa, for example—but for all extents and purposes, Saban’s new show was radically different. Needing a new name for the series, Saban kept the “Ranger” moniker from Kyōryū Sentai Zyuranger and dubbed its show Mighty Morphin’ Power Rangers. Much to Saban’s surprise, Power Rangers became an overnight sensation in America. Demand for the series was at an extreme—despite a backlash from parents due to the violent (and frequently explosive) nature of the show. But this massive success created a major problem for Saban, however: Zyuranger, as was the tradition for Super Sentai shows, only lasted for a year. After 50 episodes, Zyuranger was replaced by an entirely new show, Gosei Sentai Dairanger, the same year Power Rangers first aired in the U.S. With 60 episodes planned for Power Rangers’ first season alone—and more to come, capitalizing on the monstrous success the show had found—Saban quickly found itself running out of action footage to edit into the show. Only one option remained: while simultaneously negotiating for the rights to use Dairanger footage, Saban approached Toei and monster-suit-maker Rainbow Productions and asked them to make a half-season’s worth of new action footage and monsters using the Zyuranger costumes, specifically for use in Power Rangers. In an unprecedented move, considering the “one-and-done” approach to Super Sentai shows in Japan, Toei agreed to create the footage. The fact that footage was being shot specifically for Power Rangers allowed Toei and Saban to introduce elements from the American show that weren’t found in Zyuranger, such as a romantic relationship between the Pink Ranger and the sixth addition to the team, the Green Ranger (named Burai in Zyuranger, Tommy in Power Rangers). The new footage would be completely exhausted early into Mighty Morphin Power Rangers’ second season, and although U.S.-based filming would retain the original superhero suits from Zyuranger for the main cast, Saban moved on to using footage from Dairanger and its followup, the Ninja-themed Ninja Sentai Kakuranger, in later seasons of Power Rangers. Eventually, Saban gave up on trying to extend the original Power Rangers storyline, and instead approached the franchise in a similar way Toei did with Super Sentai, with the characters, storylines and suits changing after each standalone season, making it easier to adapt footage. Although it played a major role in turning Power Rangers into a global hit, Zyuranger’s direct impact on the franchise was over. In the West, Zyuranger long remained a sort of “secret” to Power Rangers as a franchise—it was rarely if ever acknowledge that the series had an ongoing relationship with Toei’s Super Sentai series. In fact, despite over two decades of Power Rangers shows airing in America, not a single Super Sentai show in its original form has officially made its way to the U.S..
That is, until this year: having announced a deal with Saban at San Diego Comic-Con in 2014, Shout! Factory released the first offically subtitled version of Kyōryū Sentai Zyuranger on DVD in February 2015, making the series the first ever Super Sentai show to be released in its original format in the U.S. It may have taken 23 years, but American Power Rangers fans can finally experience the show that started it all.